This product has been discontinued by manufacturer. 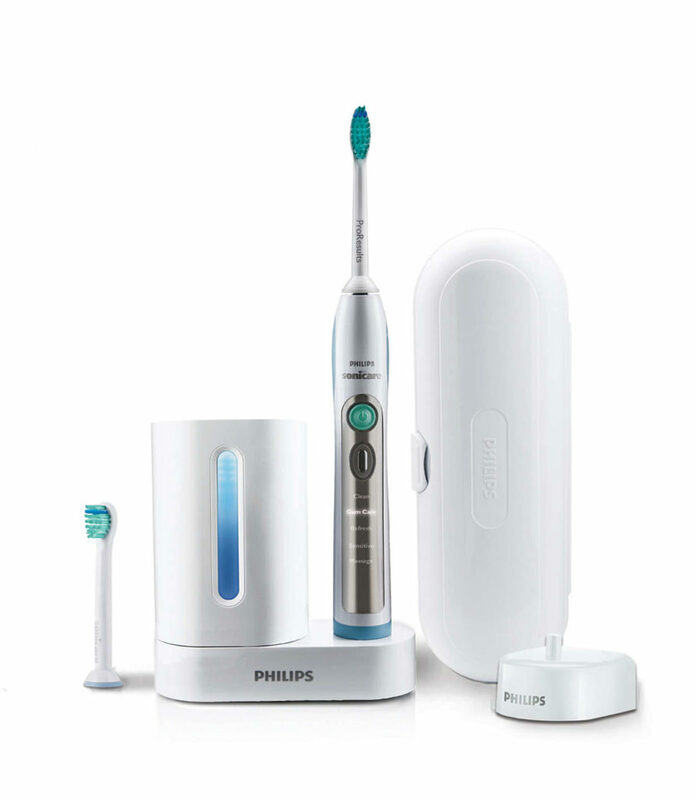 You can learn about current Philips electric toothbrush lineup here! I decided to write an article about the Philips Sonicare Flexcare Plus toothbrush (model number HX6972) because, in my opinion, it is one of these higher end toothbrushes that people often are interested. I learned that people are somehow afraid to purchase this product because there is not enough information about them except manufacturer’s advertising and reviews some sellers promoting this product. So I read all the information about Sonicare FlexCare+ I could get my hands on, including the user manual and dozens of users reviews (click here to go directly to the pricing and specification information!). Please keep reading to discover my findings. So here are some of the things you should know about this model which was among most sold power toothbrushes on Amazon at the moment of writing this review. Click here to jump straight to the availability and pricing information! Disclaimer – I have not used this product myself, and I do not own it (but I still use a similar HealthyWhite toothbrush), so I will not pretend that it is my personal experience. Again, my review is based on product owners feedback, and I will present you both pros and cons of this product. 6 Consumer Reviews – What Are Users Saying? Almost all manufacturers of rechargeable toothbrushes that are being sold today say that it can give its customers a fantastic overall mouth cleaning experience. However, not all such products live up to its promises. Actually, I can say that people often are disappointed with toothbrushes that they have bought because of advertised performance but in fact, they did not clean teeth the way people expect them to. The Philips Sonicare FlexCare+ HX6972 is not one of such toothbrushes. Thanks to its Patented Sonic Technology, you can be sure that your mouth will be cleaned thoroughly – as if you had just been to the dentist. The technology has been specifically designed to provide users with the best possible teeth and gum cleaning experience as it is able to reach places which a manual toothbrush cannot access. FlexCare Plus is able to give users a clean feeling in their mouth as it removes up to 83% of plaque including those in hard to reach areas. It will also make your teeth whiter with continuous use because of its dynamic cleaning action that can get rid of teeth stains that are caused by coffee or tea. The FlexCare+ is safe to use on all kinds of dental restorations (veneers, crowns, and others) and braces. Sonicare Flexcare+ features two timer technologies – Smartimer and Quadpacer. As our dentists are telling us from the early days, we should brush twice a day for at least full 2 minutes. The Smartimer tracks your brushing time and makes sure that you clean your teeth and gums for at least 2 minutes. When you have reached 2 minutes, the toothbrush will automatically turn off. If you want to continue using it, you have to switch it on again. The SmarTimer feature cannot be switched off. The Quadpacer is a 30-second timer that ensures that you spend equal time on brushing all parts of your mouth. First, you have to divide your mouth into 4 sections or quadrants. Then turn on your brush and start brushing one particular quadrant until you hear the Quadpacer beeping. After the beep move to the next quadrant. This way you will spend 30 seconds (if you are using Clean mode) on every quadrant. When you buy the Flexcare+ brush, the Quadpacer is turned on. You can turn this feature off if you wish. This toothbrush features 5 brushing modes. When you switch on the FlexCare for the first time, the active mode is the Clean Mode. The selected mode is indicated by the backlight. If you want to switch to another mode, you should first switch the brush off. That is because you can not toggle between the modes when the toothbrush is switched on. When the brush is off, press the Mode button to toggle between the modes. The selected mode briefly illuminates. When the desired mode is selected, turn it on and start brushing. The selection will remain active even after switching brush off until you choose another mode. One of the reasons why people choose to switch to a rechargeable toothbrush is because they want to treat gum related diseases. While it is true that the toothpaste you use is also a factor, many dentists have said that the poor condition of the gums can be attributed to improper brushing habits. A couple of years ago my dentist warned me against using a power toothbrush. She said that toothbrushes with rotating brush heads that were sold back then were just pushing plaque and food particles under the gum line. This sooner or later led to gum inflammation and gum diseases. That is not the case with the latest generation brushes, especially those using Sonic Technology and special cleaning modes for improving gum health. This model from Philips has been clinically proven to improve overall gum health already during the first two weeks of use. How is this possible? The HX6972 features the Gum Care mode that provides 2 minutes of thorough whole mouth cleaning with additional 1 minute of gentle cleaning for problem areas –, particularly along the gum line. 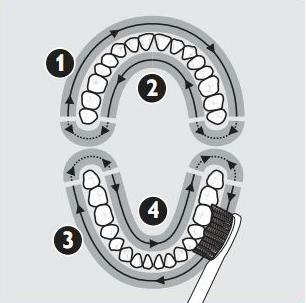 Brushing using the Gum Care mode can significantly reduce gum related problems such as gum bleeding, gum recession, and gum inflammation. If that is not enough, the rechargeable toothbrush also has a Contoured Brush Head which effectively gets rid of plaque along the gum line. The FlexCare has a built-in rechargeable battery. When the battery is fully charged, you can use it for around 42 brushing cycles. In other words, one charge lasts approximately 3 weeks. It takes 24 hours to charge the empty battery fully. The toothbrush will warn you when the battery gets low. In this case, it will beep 3 times, and the yellow recharge indicator will flash. It is suggested that you keep the brush on the charger when you do not use it. Do not worry about your electricity bills because the charger draws minimal energy from the outlet when the battery is full. There are 3 multi-voltage chargers bundled with this toothbrush. 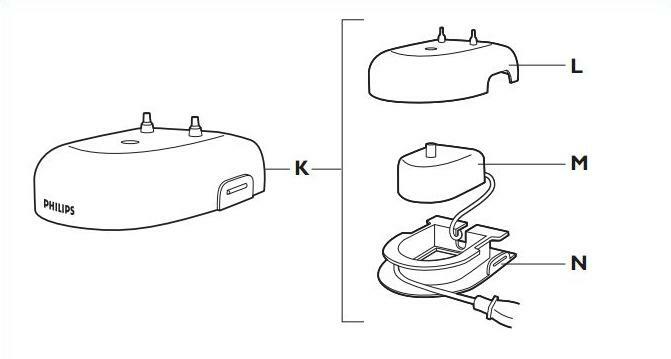 As you can see the travel charger (M) is pre-installed in the Deluxe charger (K), so you should take the Deluxe charger apart if you want to use the travel charger alone. FlexCare+ has battery indicator that shows you the battery status. Did you know that bacteria and virus can build up on your toothbrush if you are not able to dry it completely? When you flush the toilet, your toothbrush can also catch some of the bacteria particularly when it is exposed to air. These are the reasons why it would be great to have a feature on your toothbrush which can get rid of these. Philips Sonicare Plus HX6972 is bundled with UV Sanitizer – a device which uses an advanced UV technology to sanitize your brush head and eliminate up to 99% of bacteria and viruses including E coli, S. mutans, and Herpes simplex. With a simple push of a button, the toothbrush will go through a 10 minutes cycle to dry the brush head down to the bristles and make sure that it makes all bacteria ineffective. According to Philips, the UV bulb lasts about 1800 hours which means it should be changed once in 2-3 years. It is available for order on the Philips website. Easy-start program is an additional cleaning mode for first-time electric toothbrush users. This reduced power mode helps to get used to the vibrations of the power toothbrush. Initially, the brush works with a fraction of full power and increases the power automatically each time you use the brush. The full power is achieved over a 14 day period. The FlexCare Plus brush comes with the Easy-start program activated and you can turn it off if necessary. The procedure is described in the user manual. There are 3 color rings included in each brush kit. They are handy for identifying the brush heads if multiple persons are sharing one handle. Just put the colored ring on the bottom of the brush head, and your brush head will stand out from the others. Philips Sonicare toothbrush model FlexCare Plus is compatible with Philips Sonicare ProResults Standard HX6013/90 and Compact HX6023/90 brush heads and Philips Sonicare DiamondClean Standard HX6063/64 and Compact HX6072/66 brush heads. The replacement heads come in 3 packs. The main difference between 2 types of ProResults heads is the size. The ProResults Compact Heads are better for children and women who usually have smaller mouths. They also clean hard-to-reach areas of the mouth (like back teeth) better. There are 2 replacement heads bundled with FlexCare+ toothbrushes, so you do not have to worry about the replacement brushes for 6 months. You will get one Standard size ProResults brush head and one Compact head. This way everybody will be able to test both brushes and chose the best fitting one. The box size is 3.7 x 6.7 x 9.2 inches, and it weighs around 2 pounds with all bundled accessories. FlexCare Plus HX6972 design is a combination of soft sky blue, white and sky blue. There is also a stylish chrome front panel. The brush heads are easy to attach and remove for your convenience. It is also effortless to use thanks to its slim ergonomic design and rubber handle which makes it easy to grip. The toothbrush features an LCD display so that you can see what brushing mode you are using. There is also a battery indicator mentioned above in the battery section. Consumer Reviews – What Are Users Saying? This Flex Care+ toothbrush has high ratings from its users. Customers also are voting for this product with their credit cards. Flexcare Plus was the among the most bought rechargeable toothbrushes on Amazon. Another longtime bestseller was the cheap Philips Sonicare Essence. So people are choosing between the most affordable and the best. Most of the reviews are very positive. Some people are saying that the price is too steep and that the brush heads are more expensive compared to Oral B. Still the higher cost can be justified by the broad range of features this gadget has, so the buyer gets what he is paying for. Some people have managed to grow mold in the UV sanitizer, but I believe it to be improbable if you shake off the excess water from the brush after using it. I also came across the complaint the UV sanitizer base takes too much space in the bathroom. If you are looking for the latest technology from Philips, you should check out this toothbrush – Philips Sonicare DiamondClean. 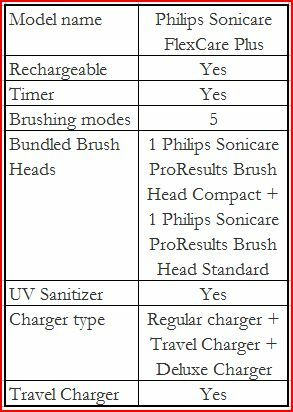 I have researched this model and written the comparison article about Philips Sonicare DiamondClean vs FlexCare Plus. My conclusion is that DiamondClean model looks fancier and features a few innovative technologies, but FlexCare Plus will do a better job taking care after your teeth and gums. There are also several power toothbrushes from Oral B with comparable features. You can learn more if you will read my review about Oral B 4000 and 5000 brushes. You can buy the toothbrush from Amazon and several other online retailers like Walmart, BestBuy, Target, or Drugstore. After checking offers in online stores that sells dental care products, I discovered that Amazon often offers an excellent price on Philips Sonicare FlexCare Plus. This power toothbrush often is bought together with its replacement heads Philips Sonicare ProResults HX6013 Brush Head Standard 3pk and Philips Sonicare HX6023 ProResults Compact Brush Heads 3pk. When you decide to buy the FlexCare+ toothbrush, you might also be interested in Waterpik Ultra Water Flosser which is useful in cleaning in-between the teeth. You may also want to get the Sonic Seal for FlexCare to provide waterproof cover to your brush heads. In fact, there are no specific accessories for FlexCare+. The UV sanitizer I usually suggest to buy is already bundled with the brush, so buyers are getting all they need.